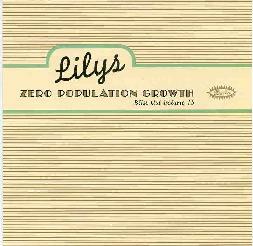 Lilys - "Zero Population Growth"
Damo Suzuki's Network - "Seattle"
Well, it was only a three hour-drive to catch the legendary Faust on this latest US tour (only a handful of cities included), so I couldn't pass up the opportunity. I was pretty impressed by their latest studio effort 'Ravvivando,' so I had high hopes. With surprisingly little difficulty, I managed to pull into the right entranceway and weave my way through the maze of well-worn industrial buildings to find the so-called theatre. It wasn't the most attractive site... a tad stale, dusty, and bits of plaster hanging off the walls and ceiling, but why not open it up for no-frills shows? We're there about the music, not the glitzy ambience. First up was Twine, a local all-electronic/industrial duo that played 40 minutes worth of syncopated e-bass thumping with other applications of noise that turned the house into a indistinct continuum of sound. Faust's equipment covered the entire stage, so I never really saw the two set up in front of the risers, so only got to watch the stark black and white faces and images that were projected on the rear wall. Well, they were over-magnified such that they covered more of the ceiling actually. Musically-speaking, there wasn't much to get excited about, but it did seem rather appropriate in an odd sort of way to begin the night like this. At 10 PM, another local outfit, Operation Re-Information hit the (area in front of the) stage. This time a four-piece, ORI were far more light-hearted, rather much like B-52s meets Kraftwerk I suppose (or simply Devo if you prefer). Again, it was hard to see what was going on, but it appeared that several of the members at least (including one female) played shoulder-mounted computer keyboards in lieu of real instruments. The "lightshow" was more like a commercial software demonstration... a single overhead projector and a screen, on which various images (computer diagrams, flowcharts, household appliances, etc.) were depicted and overlaid, along with some indication of how the ORI platform (as it were) fit in with the big picture. ORI's music is generally busy electronic jamming, with some techno-ish elements though not really techno, nor industrial. Call it Corporate Software Rock I guess. Live vocals, some peculiar narration, and lots of vocal samples were added to the mix. The most interesting piece sounded like an electronic elephant stampede along with crazy squealy synths overhead. Wild stuff. During the intermission I learned ORI had an album out entitled 'Universal Standard 84000,' featuring among other tracks "LUNCH" (aka Large Ultra-Noisy Computer Hardware). I imagine that Manny (at manny@telerama.com) would help you acquire a copy if you were so inclined. Faust took the stage a little after 11 PM, and played a 100-minute show of their recent repertoire only, including a great deal of improvisation and experimentation. I have to admit it was a disappointment not to hear any familiar tunes from the original 1970's Faust, but given that 'Ravvivando' (their latest work) means 'Rebirth,' I guess I can understand. But I imagine that others in the audience were equally disappointed not to be thrown at least one little bone. Oh, well, such is life. The opening of the show went pretty much in order of the new album following a lengthy intro, tracks 1-4 eventually being performed in a quite different and far more extensive way. The heavy-handed rhythms and punctuating beats of "Ein Neuer Tag" took a long time to develop, and a great deal of reverberation was going on, making it quite a loud affair. Co-leader/percussionist Werner 'Zappi' Diermaier had an impressive arsenal of weaponry at his disposal... what looked to be a self-constructed two-way drumkit, with a central sideways-mounted bass drum being accessible from either side. On stage left, the kit was designed for playing while seated with more standard toms and such. The opposite side Diermaier played while standing, with only a single snare and tom, plus a whole assortment of other bits of plumbing and sheet metal for banging upon. Somewhere later in the set, I'm sure I remember a partially-disguised version of "Apokalypse" appearing. On this one (as for much of the show), guitarist Steven Wray Lodbell (who looked rather like Grizzly Adams in his flannel shirt and toque) demonstrated his peculiar technique of playing a constant stream of slowly-shifting notes colored by moderate feedback. Wedged into the back of the stage was the other founding member Hans-Joachim Irmler, who fed in the strange electronic noises and beats whenever required (i.e., often). The last forty minutes or so turned a little tiresome I have to say, as Zappi (and another seated individual I didn't even notice until late in the set) played around with lots of their toys for long periods of time. Diermaier is a physically imposing and balding man, and while banging around on pipes, throwing panels of sheet metal around, and then lighting off some flares, he kinda looked like an ill-behaved gigantic toddler up there. Anyway, I really enjoyed the first half of Faust's performance (*before* it turned into the industrial/krautrock version of Stomp!) and was glad I witnessed this rare performance on US soil. The Millvale Theater turned out to be quite a bit smaller than I would've guessed, but they managed to jam in well over 100 (perhaps closer to 200) folks into the space. In the recent past, this venue has also housed some other progressive and space rock bands (including Farflung and other Strange Daze performers) with good publicity, so Manny (the promoter) should be commended for trying to build up an audience for innovative music there in the Steel City. I'm sure I'll be back soon to check out more shows. Another satellite entity in the ever-burgeoning Philadelphia Space Rock universe, the Lilys (who recently toured with support from the Asteroid #4) have done this fun little side project for the Bay Area-based Darla label. Their 'Bliss Out' series tends toward the hypnotic/drone styles of modern music, and so the Lilys' collection of pure, unadulterated kraut-groove rock fit right in. The six tracks presented, totalling a little over a half-hour are straight out of the old Düsseldorf mode...motorik beats, looping and gurgling synth-bass, and playful keyboard melodies on top. This material differs greatly from the 60's-style pop/psych of their latest full-length release "The 3-Way," which leads me to believe that the Lilys aren't intending to become full-time krautrock re-creators. Anyway, as little new ground as 'Zero' covers, I still had a lot of fun with this album. "The Escape" is an eight-minute motorized journey that could have led off the recent Neu! tribute without anyone realizing it wasn't a cover. "The Law" is a more stationary electronic stew that reflects more of what Cluster were doing in the mid-70's. Nicely done. A little later, "You Win" relies on a non-intrusive electronic beat and some rolling, pulsing synth noises to carry the rhythm and only a minimal lead line consisting of a few synth tones sprinkled here and there. Simple, but effective. The finale "Back Again" revisits this approach once more, but with more hollow sounds...kind of an electronic steel drum band. Again, it's hard for me to argue that something like this needed to be made in 1999, seeing as the material is really 25 years old, but then again there really weren't *that* many albums originally made in this style and the Lilys are probably using electronics that didn't exist back then (though I can't tell the difference). So as long as everyone remembers exactly who it was that pioneered this music, then I'm perfectly ok with this album. What the Lilys set out to do here, they did it well and because it mimics some of my favorite albums from that classic age, it's a nice vicarious way of experiencing that same sense of discovery that prevailed in the 1970's. Damo has been pretty active over the years and this 2-CD live set from an October '98 show indicates that this Can alumnus has still got some cool music in him. With a band that includes Michael Karoli, Damo's Network performs some thoroughly enjoyable psychedelia, much of which has the classic Can sound. Disc One (or Upper Disc as it's called) starts with "Half Of Heaven At Half Past Eleven", a shimmering acidic tune with slow wah-wah guitar, violin, and a slow, steady drum beat. Trippy meandering psychedelia with Damo's unmistakable vocals. When Karoli switches from violin to guitar the dual sound of extended note acid licks and choppy, slightly bluesy licks is an intense combination. The music isn't particularly earth shattering but as acid psych with an avant garde edge it sounds great. One of the other tunes I liked on Disc One are "Fall Of Fire Bird", which is a bit boring at first, but builds up to include some really nice, once again, dual guitar sounds played against a pleasant melody. 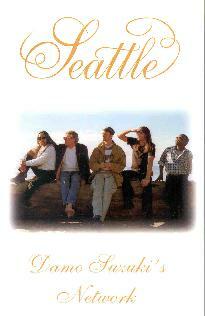 And "Light Of Fortune" is a great head boppin' jam tune in which the music flows beautifully. Disc One was enjoyable, but Disc Two (Lower Disc) is far more musically impressive. On disc one it was cool hearing Suzuki and Karoli together again, but on disc two we hear the masters at work. All the great exploratory freeform Krautrock-psych journeys of Can are here. Karoli's quirky guitar style is joined by electronics and efx from Dustin Donaldson and Mark Spybey which help Disc Two blast firmly into the stratosphere. "Port Of Timeless Situation" is an aggressive hard driving track but also has a raw jam feel added to the freakout elements. The electronics provide a piercing backdrop to the crashing guitars and slow sounding rhythm section. Also included is a version of Can's "Mother Sky" with blistering guitars and a thundering rhythm section. Damo's wailing vocals make this a potent track that hails back to Can itself and the best of the noise-psych bands. "Bellevue Cocktail/Floating Bridge Mix" is 30 minutes of sonic aggression that goes on perhaps a bit too long, but does travel through some funky sections in addition to the noisy psych-metallic chaos and on to another funky and heavily percussive part. Imagine Damo singing with a more psychedelic version of late 60's Miles Davis and you'll get something like this track during the funk segments. Overall, this 2-disc set proves that the old pioneers have still got it, if not necessarily from beginning to end.